Every November, we recognize just some of the wonderful people and groups connected to DSC. Today, we are meeting our 2017 Personal Achievement Award Winner! We are excited to present this year’s award to Ms. Laura Lindemann! 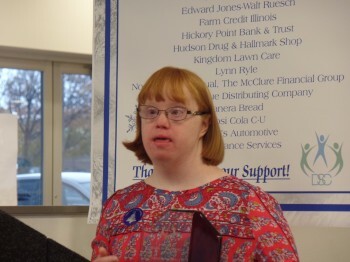 Laura has been working with DSC since March 2004. She has been working at the Business Operations and Employment Services building on Clark Road and was also very active with the Prompting Theater for many years. Laura is kind and respectful and although she may appear quiet to some, her confidence is amazing! Laura takes her job responsibilities very seriously and it is evidenced by how well she performs. For all of us in the working world, we are truly blessed when we enjoy the work we do, and Laura has enjoyed those same blessings. And, we also know that sometimes when we enjoy what we do, we don’t always look to make a change because, well, we are happy and doing a good job! But…what if we could do more and enjoy it even more? DSC staff knew Laura could be successful working in the community and they often shared this with her. But…she was happy and really wasn’t interested in trying anything new. So…every so often, staff re-approached the idea with her leading up to an opportunity at Scotty’s Brewhouse to fill a hostess position. Laura decided to give it a try and on January 25th this year she was hired. Now…we want you all to know…if you haven’t been to Scotty’s when Laura is working to have her seat you, you will want to find out her schedule so you can enjoy her kindness, efficiency, and smile. And, at the same time, Laura continues taking her job responsibilities seriously demonstrates a strong work ethic. And we are clearly not the only ones who see her success and the perfect match this position holds for her skills. Laura’s supervisors and co-workers see this too, as she received Employee of the Month in July, only six months after starting her new job. What is even better is the fact that some of the regulars at Scotty’s request Laura to seat them…waiting for her instead of being seated by another Scotty’s staff member. One might think that because she has a job in the community that she would quit working her DSC job…Nope! Not Laura. She enjoys what she does so Laura now works two jobs – maintaining her original job at DSC and her newer job at Scotty’s! But…there is even more! Laura is active in her community as a member of the Junior Woman’s Club. She donates her time with the Club recently helping at DSC during the set up for C-U Oktoberfest and also is co-chair for the support they offer the Tree of Hope Kick-Off and Recognition Event! One skill Laura is learning is how to balance all her responsibilities with work, her social commitments, and her family. Laura is passionate about all three, so she is mastering the difficulty of juggling a lot of goodness! Laura, congratulations on being the 2017 Personal Achievement Award winner!